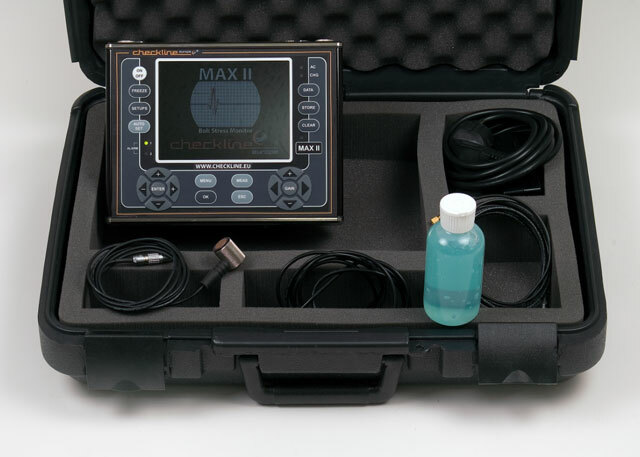 The MAX II Ultrasonic Bolt Tension Monitor is designed for precision measurement of fasteners up to 100 ft / 30 m in length. It incorporates all of the great features of the original MiniMax unit, with improved features, hardware, speed, and range. The MAX II is designed for use in a wide range of industrial and lab applications including wind turbines. 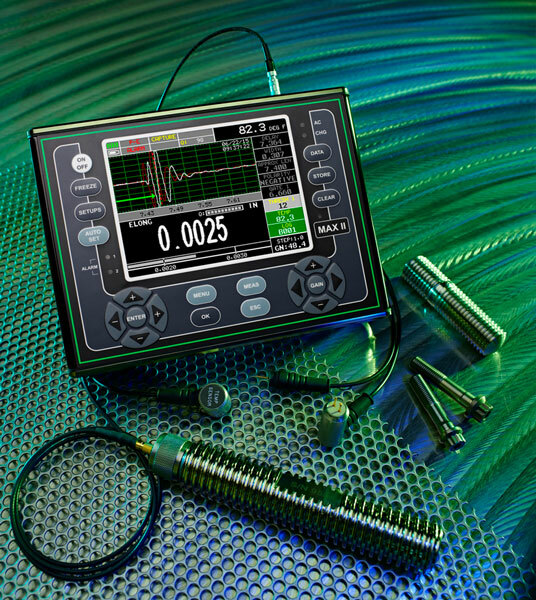 The MAX-II Bolt Tension Monitor enables you to accurately monitor bolt tension ultrasonically measuring the elongation (change in length) of your bolts. 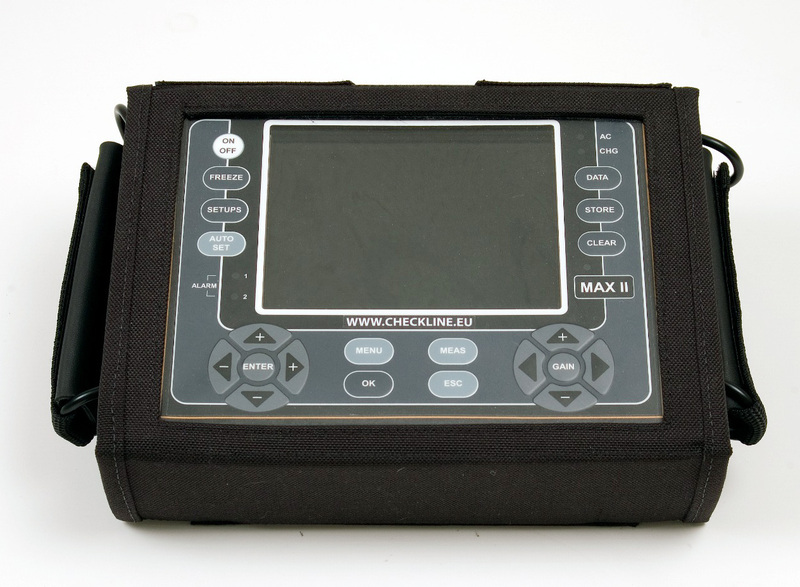 It enables you to re-visit your bolts in certain intervals and monitor the quality of your bolt connections over time. The new "Auto Correlation" feature that helps you to optimize your transducer placement. Together with the large QVGA sunlight readable color display and the calibration function, it is very easy to use without the steep learning curves associated with other models. Measures: Elongation, Load, Stress, Strain and Time (nanoseconds). Setups: 64 custom user defined setups; factory setups can also be edited by the user. Auto Set: Automates the detection, scope, and display setting process for each individual bolt. Gates: Three measurement gates, depending on measurement mode used, with adjustable start and threshold. Alarm Limits: Adjustable Hi/LO tolerances with visual LED’s and audible beeper. Hardware alarm outputs (accesory cable required). Field Calibration: Vector or Regression correction curve for increased accuracy using Load & Stress. 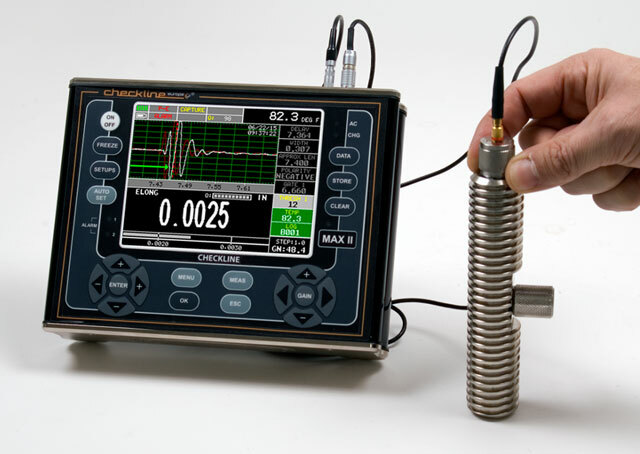 - The first cost effective ultrasonic solution available on the market. MAX-II supplied with 4 oz. Bottle of Couplant, RS232 Transfer Cable Lemo to DB9, USB converter cable to DB9, Carrying Case, 10’ Lemo to Microdot Transducer cable (N-110-0020), PC Utility Software, Operation Manual and Certification. 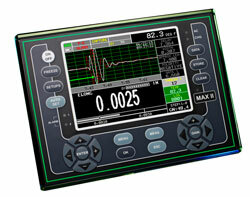 Measurement Range 1 to 999.999in (2540cm) in pulse-echo(P-E) measurement mode. Range will vary using multi-echo modes – dependent on material type and consistency. Bolt Materials Select types from a preset or custom list. Power Connector 12v @ 2amps, adapter 100-240 VAC, .7 Amps, 50-60 Hz.5 Pin Lemo (includes):RS232Output – RS232 PC serial interface.Alarm Outputs – Two independent alarm outputs triggered by the gates.Analog Out – Proportional outputs (amplitude or distance), 0-10 volts. Lithium Ion Pack 10.8v, 2 amp hrs, typical operation 18hrs. Battery life (continuous use) Alkaline (12 hrs), Nicad (5hrs), and NI-MH (12hrs), with default settings. Screen Refresh Rate 60Hz. Timing: Precision TCXO timing with single shot 100 MHz 8 bit ultra low power digitizer. Pulse Width Selectable step options Spike, Thin, Wide, HV Spike, HV Thin, HV Wide, TB .5MHz, TB 1MHz, TB 2MHz, TB 5MHz, TB 10 MHz. Spike 40 ns, Square Wave 80 to 400 ns, Tone Burst 50 ns to 1 microsecond. Gain 0 to 110dB with 0.2dB resolution. Manual and AGC control. 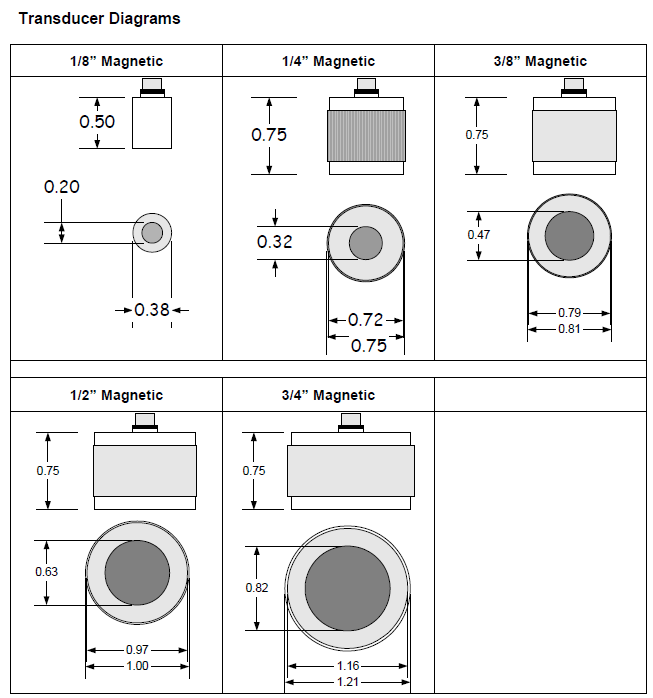 Damping 50, 75, 100, 300, 600, & 1500 ohms. Frequency Band Broadband 1.8 – 19 MHz (-3dB) filter. 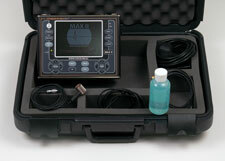 Amplitude Measurement 0 to 100% FSH, with 1% resolution. Measurement Gates Three independent gates depending on measurement mode selected, with audible and visual alarms. Amplitude 5-95%, 1% steps. Glue-On Available for short bolts with minimal/short elongations to eliminate transducer placement errors. 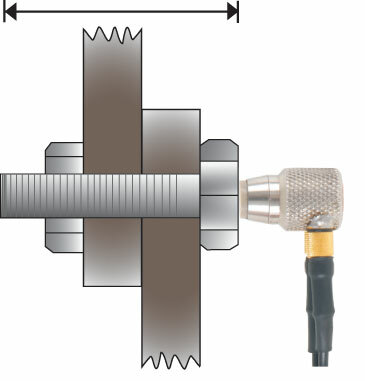 Connectors Microdot, Lemo 00, or BNC options depending on the transducer model selected.